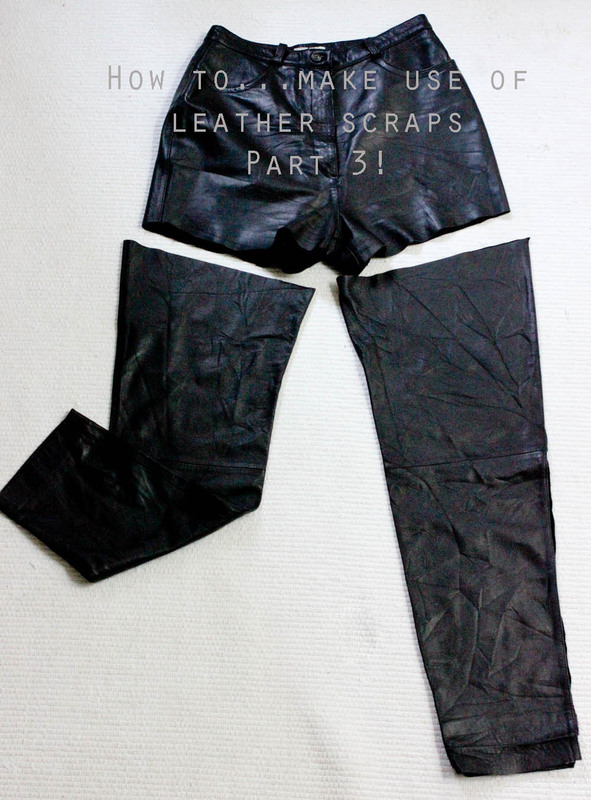 The final part (from these pair of trousers anyways) of what to do with leather scraps is here (finally!) After seeing this really pretty COS collar necklace I was inspired to create a leather version, here is how I did it. Fabric Scraps for under the collar. I created a template in paper before cutting the shapes out of leather to ensure it was the right size and shape I wanted. Once I finalized it I pinned it to the leather and cut out the shapes. Depending on what kind of collar you want yours to be (bling, subtle, rock n' roll) will depend on your design for the embellishment. I decided upon a more subtle look and chose to have matt metal sequins. Depending on which design you are looking for will depend on the design, I was torn between just embellishing the edges or covering the whole collar. I opted to do the second option. I started at the point and worked my way up...this is fairly time consuming, but perfect to do in front of a good movie. Take the fabric you have chosen as lining and cut out shapes like in Step 1. using the template only cut 1cm/ 3/8" from the edge. Keeping the template pinned to the fabric use an iron to fold the excess fabric over the template this will allow the raw edges to be hidden when attached to the leather. Repeat on other side. Removing the template place the fabric on the corresponding leather shape and pin in place. Taking the Gross Grain/Ribbon measure and cut two lengths 15"/38cm. Attach one length to each side of collar with a needle and thread. Cut the loose end at a diagonal to reduce fraying. With a needle and thread join the two pieces together, I chose a simple running stitch to sew them together. Repeat on the other side. Attach the two pieces together at the inner point. Start by creating a few stitches on one side first then connect to the other. And Viola! You are finished! This is a fairly easy project and can be repeated using different fabrics and designs. Hope you have fun making your own version! follow me on Instagram: @vicandlily to see sneak peaks of up and coming projects.